thot i might start exercising a bit.. ARGHHH!! ..hmph! 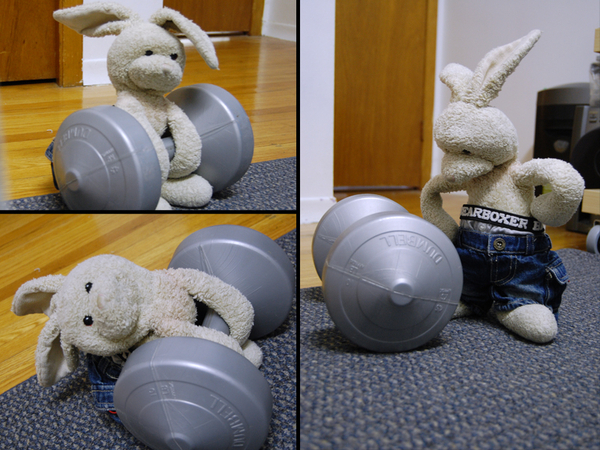 They are called dumbbells and not cleverbells for a good reason. You gotta be dumb to use ‘m. Zackary Rabbit you are going to be in great shape when yo do that I do that too when I can be bothered! Zackary Rabbit Be careful! You're going to pull a musckel! Zackary Rabbit Av u lost yr mind???????? ?